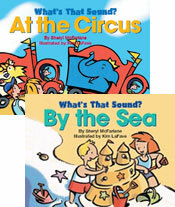 Four great new board books for little noisemakers! Wherever you live, in the middle of a big city or on a farm, or even by the sea, toddlers revel in the unique cacophy of noisy delights that surround them every day. In the city, garbage trucks CLATTER and CLANG, car horns go BEEP, BEEP, and sirens WAIL. 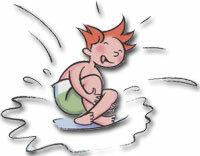 On the farm, tractors RUMBLE, Quaking ducks SPLISH SPLASH, and pigs SNORT, SNORT, SQUEAL. By the sea, seagulls SCREAM and sea lions BELLOW, BARK, and ROAR and if you visit the circus, you can hear TUMPETING elephants and ROARING tigers. These bright, colorful board books serve a dual purpose for inquisitive little ones. Not only do they link noises to objects but they encourage the association of meaning to letters on a page—the first, crucial step in developing young readers. 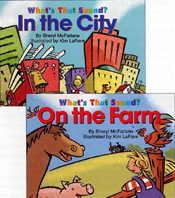 Author Sheryl McFarlane’s rhythmic read-aloud texts are perfectly complimented by Kim LaFave’s bright and colorful scenes. A glorious series of books for little noisemakers everywhere. 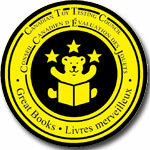 The children at the Canadian Toy Testing Council have chosen What’s That Sound? By the Sea as one of the 10 “Great Books” of the year! What’s That Sound? 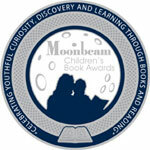 By the Sea is the Moonbeam Award silver medalist in the Board Book category. Published by Fitzhenry & Whiteside: Toronto, 2004.